We have attendance data on 314 high school juniors from two urban high schools in the file nb_data.dta. The response variable of interest is days absent, daysabs. The variable math is the standardized math score for each student. The variable prog is a three-level nominal variable indicating the type of instructional program in which the student is enrolled. Below we use the nbreg command to estimate a negative binomial regression model. The i. before prog indicates that it is a factor variable (i.e., categorical variable), and that it should be included in the model as a series of indicator variables. The output begins the iteration log. We can see that it starts with fitting a Poisson model, then a null model (intercept only model) and finally the negative binomial model. Since it uses maximum likelihood estimate, it iterates until the change in the log likelihood is sufficiently small. The last value in the iteration log is the final value of the log likelihood for the full model and is displayed again. The log likelihood can be used to compare models. The header information is presented next. On the right-hand side, the number of observations used in the analysis (314) is given, along with the Wald chi-square statistic with three degrees of freedom for the full model, followed by the p-value for the chi-square. This is a test that all of the estimated coefficients are equal to zero–a test of the model as a whole. From the p-value, we can see that the model is statistically significant. The header also includes a pseudo-R2, which is 0.03 in this example. Below the header you will find the negative binomial regression coefficients for each of the variables, along with standard errors, z-scores, p-values and 95% confidence intervals for the coefficients. The variable math has a coefficient of -0.006, which is statistically significant. 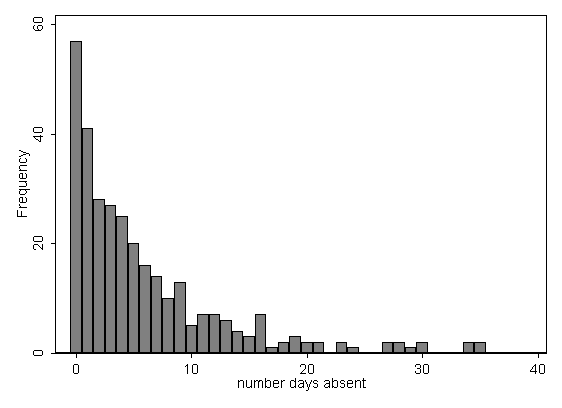 This means that for each one-unit increase on math, the expected log count of the number of days absent decreases by 0.006. The indicator variable 2.prog is the expected difference in log count between group 2 (prog=2) and the reference group (prog=1). The expected log count for level 2 of prog is 0.44 lower than the expected log count for level 1. The indicator variable 3.prog is the expected difference in log count between group 3 (prog=3) and the reference group (prog=1). The expected log count for level 3 of prog is 1.28 lower than the expected log count for level 1. To determine if prog itself, overall, is statistically significant, we can use the test command to obtain the two degrees-of-freedom test of this variable. 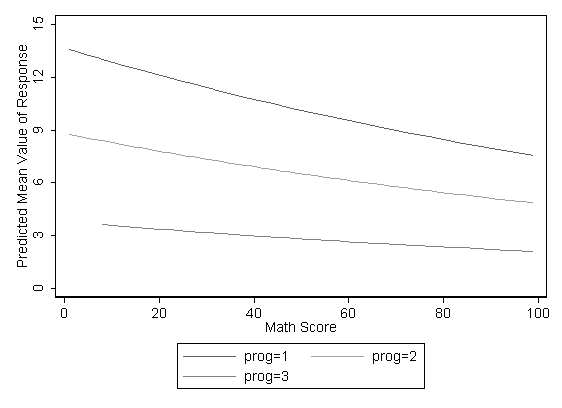 The two degree-of-freedom chi-square test indicates that prog is a statistically significant predictor of daysabs. Additionally, the log-transformed over-dispersion parameter (/lnalpha) is estimated and is displayed along with the untransformed value. A Poisson model is one in which this alpha value is constrained to zero. Stata finds the maximum likelihood estimate of the log of alpha and then calculates alpha from this. This means that alpha is always greater than zero and that Stata’s nbreg only allows for overdispersion (variance greater than the mean). Below the table of coefficients, you will find a likelihood ratio test that alpha equals zero–the likelihood ratio test comparing this model to a Poisson model. In this example the associated chi-squared value is 926.03 with one degree of freedom. This strongly suggests that alpha is non-zero and the negative binomial model is more appropriate than the Poisson model. We can also see the results as incident rate ratios by using the irr option. The output above indicates that the incident rate for 2.prog is 0.64 times the incident rate for the reference group (1.prog). Likewise, the incident rate for 3.prog is 0.28 times the incident rate for the reference group holding the other variables constant. The percent change in the incident rate of daysabs is a 1% decrease for every unit increase in math. The coefficients have an additive effect in the log(y) scale and the IRR have a multiplicative effect in the y scale. The dispersion parameter alpha in negative binomial regression does not effect the expected counts, but it does effect the estimated variance of the expected counts. More details can be found in the Stata documentation. To understand the model better, we can use the margins command. Below we use the margins command to calculate the predicted counts at each level of prog, holding all other variables (in this example, math) in the model at their means. In the output above, we see that the predicted number of events for level 1 of prog is about 10.24, holding math at its mean. The predicted number of events for level 2 of prog is lower at 6.59, and the predicted number of events for level 3 of prog is about 2.85. Note that the predicted count of level 2 of prog is (6.587927/10.2369) = 0.64 times the predicted count for level 1 of prog. This matches what we saw in the IRR output table. Below we will obtain the predicted number of events for values of math that range from 0 to 100 in increments of 20. The table above shows that with prog at its observed values and math held at 0 for all observations, the average predicted count (or average number of days absent) is about 7.72; when math = 100, the average predicted count is about 4.24. If we compare the predicted counts at any two levels of math, like math = 20 and math = 40, we can see that the ratio is (6.072587/6.845863) = 0.887. This matches the IRR of 0.994 for a 20 unit change: 0.994^20 = 0.887. The user-written fitstat command (as well as Stata’s estat commands) can be used to obtain additional model fit information that may be helpful if you want to compare models. You can type search fitstat to download this program (see How can I use the search command to search for programs and get additional help? for more information about using search). You can graph the predicted number of events with the commands below. The graph indicates that the most days absent are predicted for those in the academic program 1, especially if the student has a low math score. The lowest number of predicted days absent is for those students in program 3. Count data often have an exposure variable, which indicates the number of times the event could have happened. This variable should be incorporated into your negative binomial regression model with the use of the exp() option. You can also run a negative binomial model using the glm command with the log link and the binomial family. You will need to use the glm command to obtain the residuals to check other assumptions of the negative binomial model (see Cameron and Trivedi (1998) and Dupont (2002) for more information). My raw data contain evidence of both overdispersion and excess zeros . Is a zero-inflated negative binomial model the only count data model that can account for both the overdispersion and excess zeros ?